Nip here and tuck there, the appearance has dramatically changed but the inner spirit remains the same. 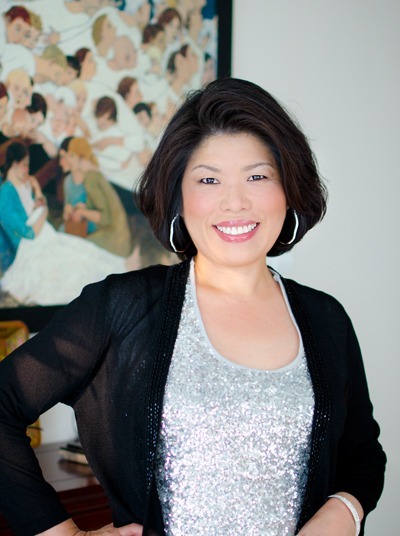 Excited to celebrate a new day in blogging, this is the recipe I chose. Are you tired of leftover Thanksgiving turkey? Craving for four legged animal again instead of bird? But want something easy and comforting, like a bowl of soup, in these cold weather outside? I should have advertised this recipe on TV. This world is full of satisfaction guaranteed ads. Some works and some don’t. Recipes are sometimes like that too. Some works, some don’t. Usually prepared in a large shallow pot placed in the middle of the table with portable burner to cook with. It is best to share with many people as it is cooking right on the table but you can enjoy small portion just for you, or you and your significant others. 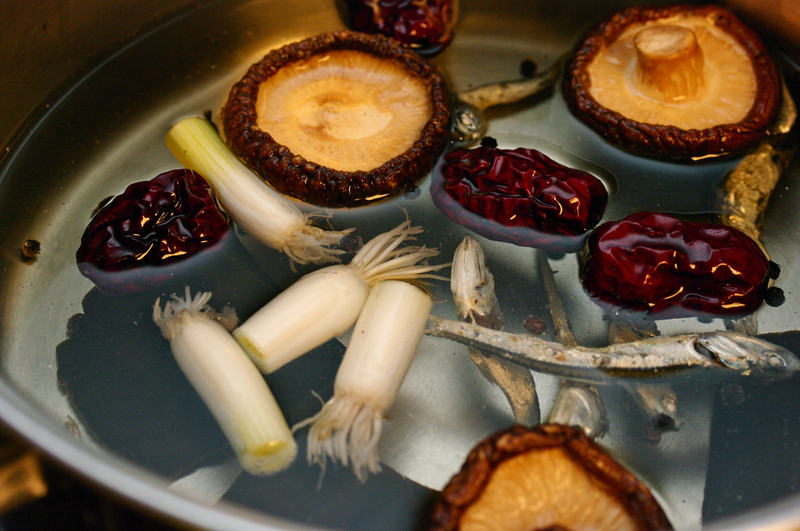 Most important thing in making any Korean hotpot is using a good stock. I have seen some people using plain water to this dish. 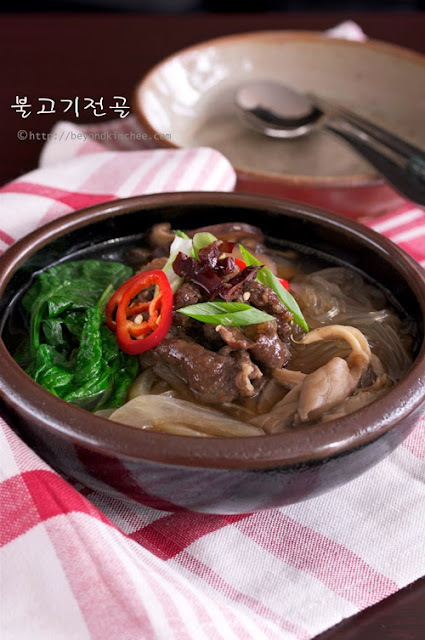 Why rinse out the flavor of Bulgogi with water? Please don’t. If you use water, my satisfaction guarantee is VOID! The earth provides bounty of flavor packed creatures. Use them! You will be amazed how all these flavors balance each other. 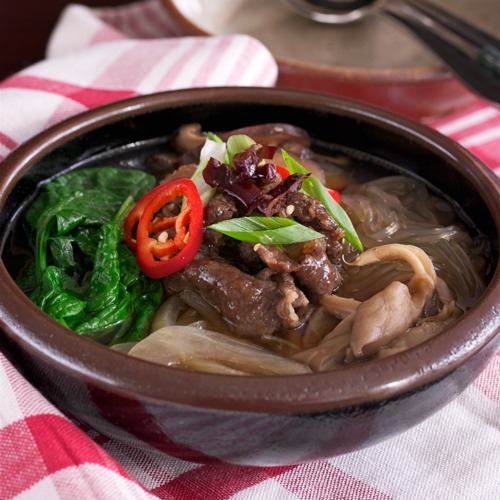 If you need a recipe for Bulgogi, click here. 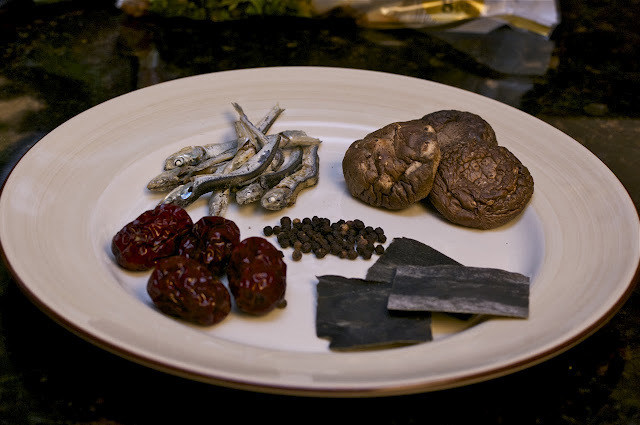 Dried anchovies, dried mushrooms, dried sea kelp, dried dates, and black peppercorn. Of course I forgot another ingredient in the photo. Add rooted tips of green onion. Combine with water, boil and simmer for 5 minutes. Let it sit for 20 minutes, covered, so that all the flavor will ooze out. 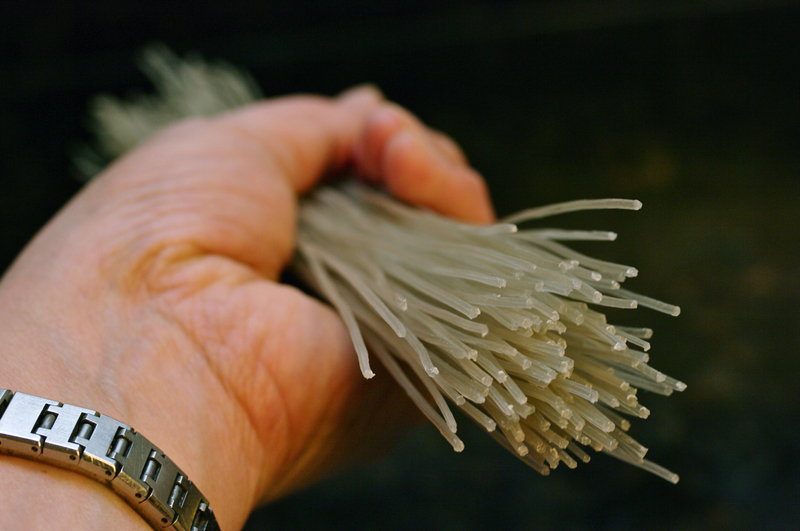 Grab some Dangmeon, Korean sweet potato noodles, aka, Japchae noodles. Soak them in the boiling hot water for 10 minutes. They will relax and soften their attitudes. While waiting, prepare vegetable of your choice. 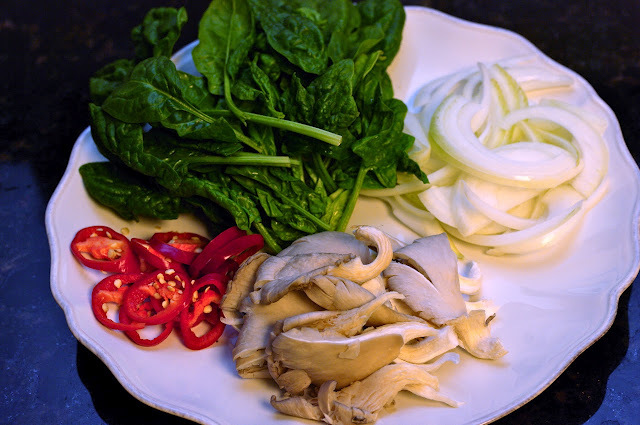 I happened to have spinach, oyster mushroom, onion, and red chili in my fridge. Cabbage, zucchini, bokchoy, and tofu are good choices as well. 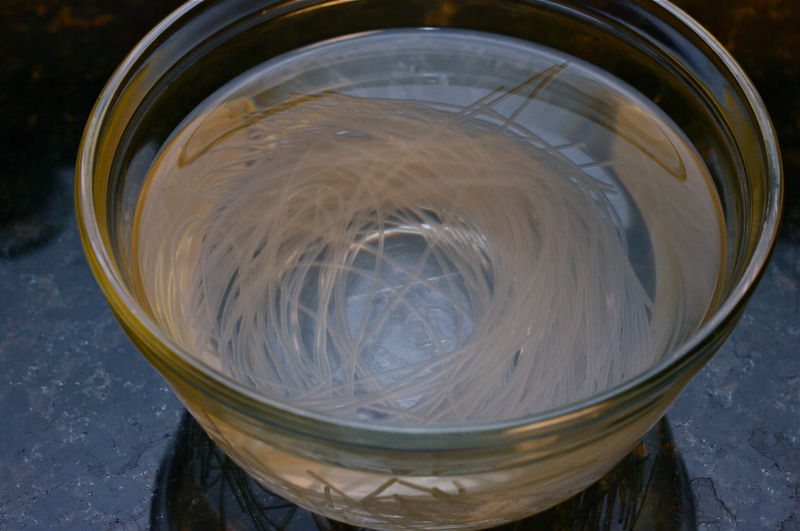 Hmmm…, The stock looks fabulous after 20 minutes. 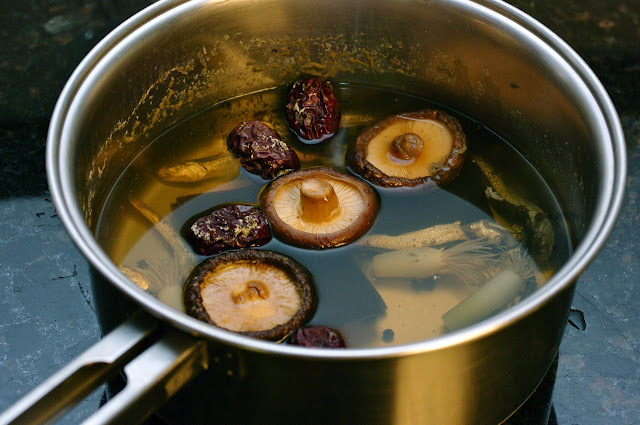 Strain the stock but reserve the mushrooms and the dates. 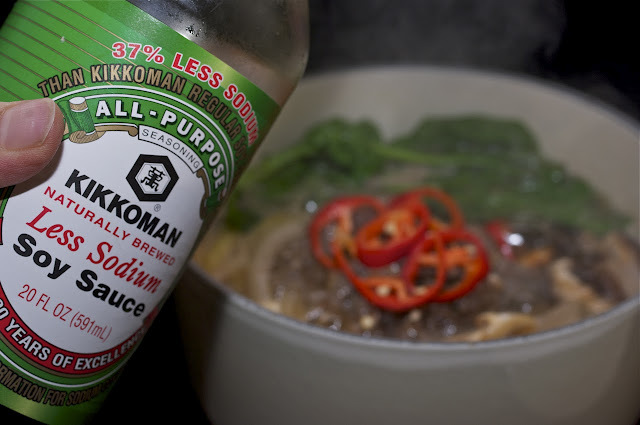 Oh, don’t forget to season the stock with soy sauce and rice wine. Dates are for garnish later. Place drained noodles on the heavy bottom pan. Arrange vegetables and the marinaded Bulgogi the way you like. Pour the gorgeous stock over, about half way in the pot. 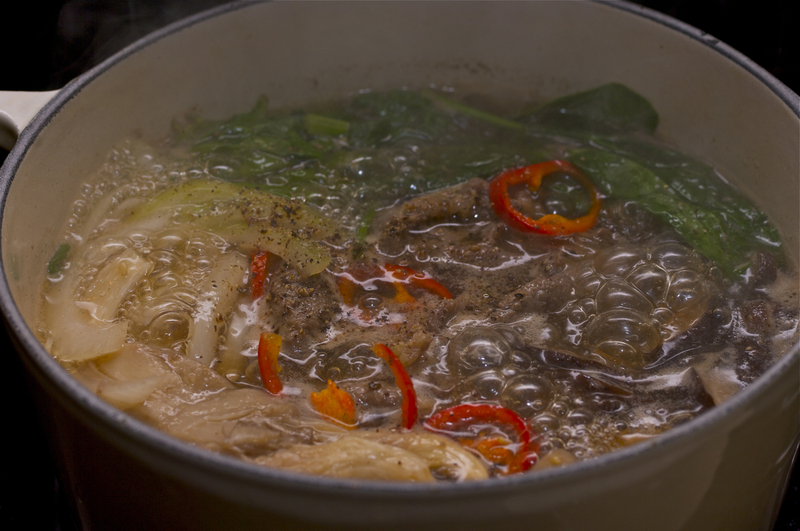 Taste the broth to see if it is seasoned right. You can add more soy sauce or salt. Boil until the beef is just cooked. You can spread the meat around to cook evenly. Do not overcook. This is not a stew. 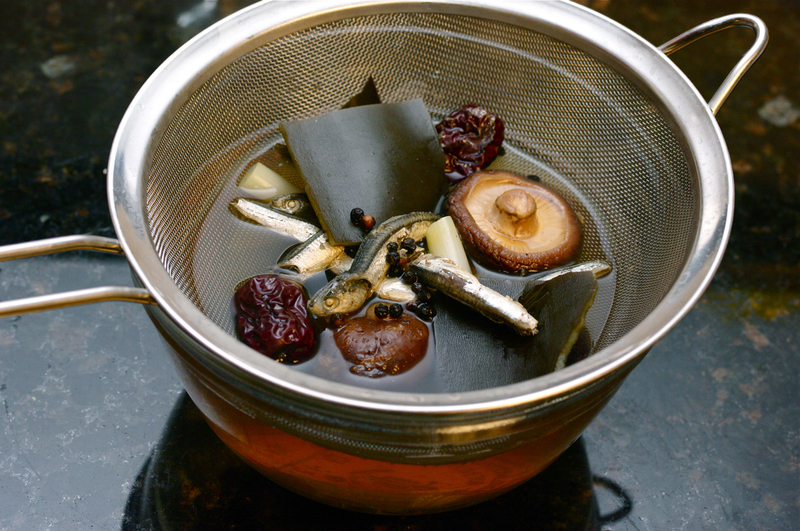 the stock mingle the flavor each other. So sorry! I ate the whole pot without sharing with you. 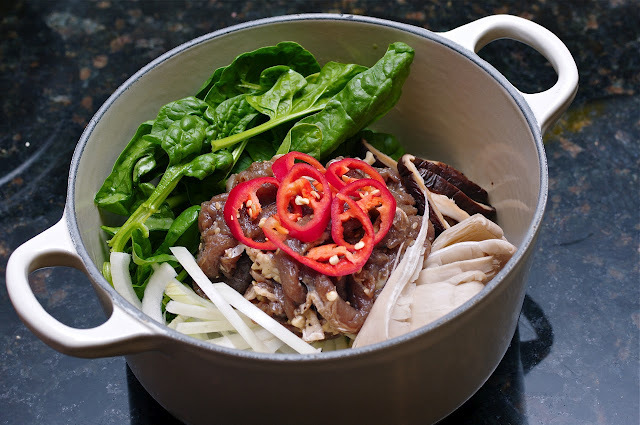 For the stock, in a medium sauce pan combine all the ingredients EXCEPT soy sauce and rice wine. Bring to boil, reduce the heat and simmer for 5 minutes covered. turn off the heat and let it sit for 20 minutes so the flavors will get intensified. Strain the stock through a mesh, reserve the mushrooms and dates, but discard the other fillings. 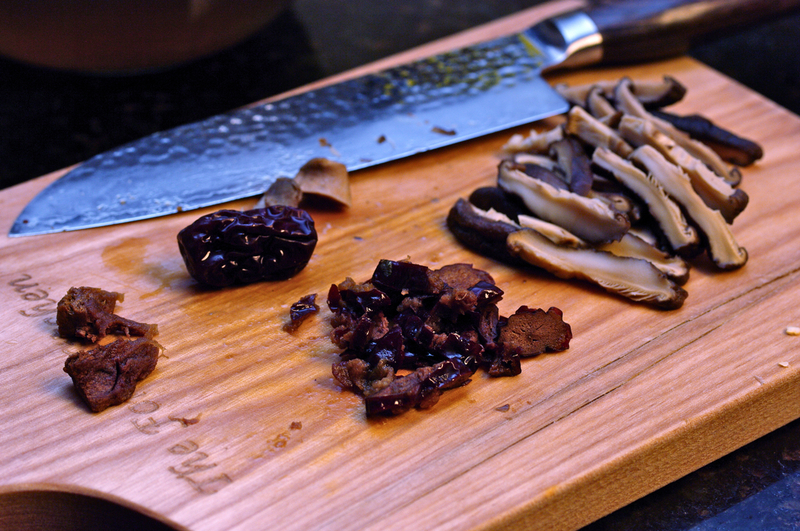 Slice the mushrooms and the dates, set aside. 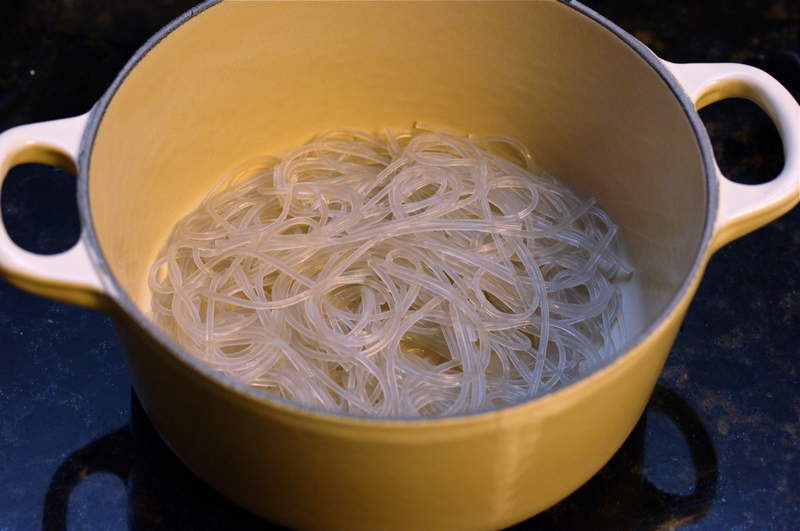 In a 2 qt heavy bottom pot or Korean stone pot, place the noodles on the bottom of the pot. Add the spinach, onion, mushrooms over the noodles. 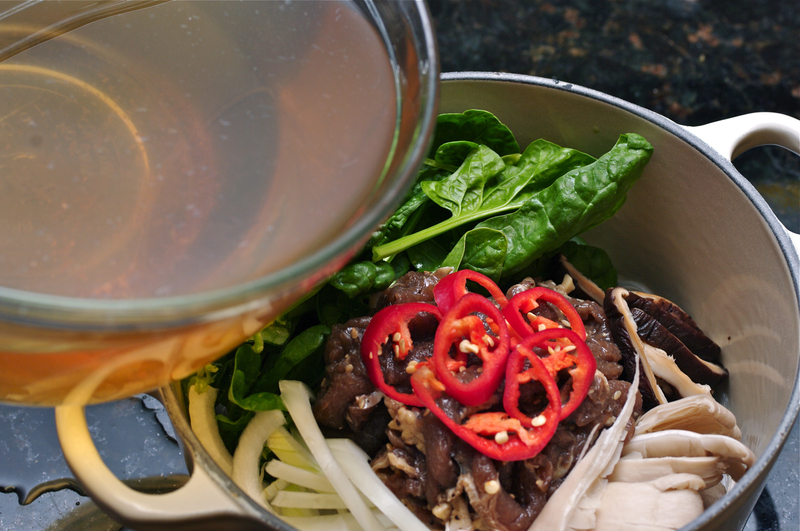 Place the marinaded Bulgogi in the middle. Pour the reserved stock over them until the stock will reach to just to cover the vegetables, about half way in the pot. Bring them to boil spreading the meat around to cook evenly. taste the broth to see if you need to adjust seasoning. You will need some more salt and pepper. Only cook until the beef is just cook through, about 2 minutes. Add the reserved dates on top with some red chili and green onion for garnish. Serve immediately. All you need is some Kimchee on the side. Enjoy! love this! 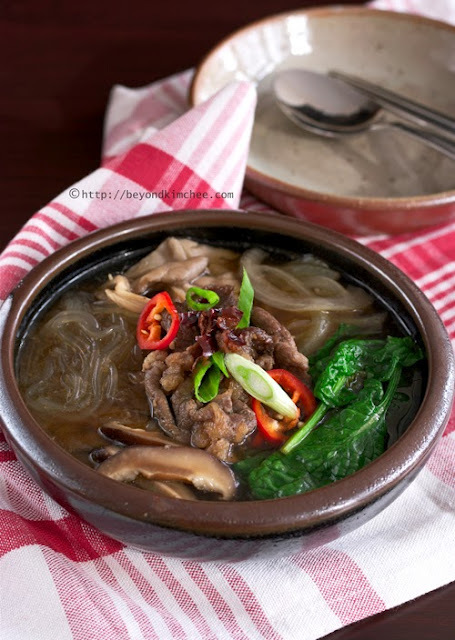 the bulgogi must go so well with the dangmyeon. 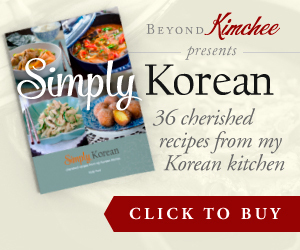 I love your recipes, they are AUTHENTIC korean recipes and not the americanized version recipes. Wonderful...but you need RICE!!! No satisfaction for me without a bowl of rice.